Foam blank, 1/8'' redwood stringer, tinted Volan laminate with naose and tail/fin patches, resin pin lines, r/h post production plug. 7'' x 6'' base @ 4''. Leg rope hole, in leading edge. Purchased used August 2003 by Hamish Fitzsimmons, Sydney. 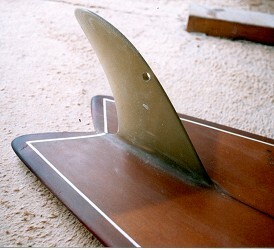 The swallow tail is usually attributed to Ben Apia, circa 1972 and used extensively in this original format, and commonly used on the Stinger 1974 (Ben Apia) and the Twin Fin 2 1976 (Mark Richards). 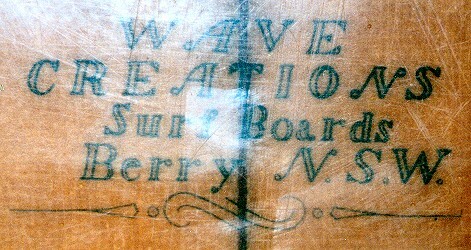 The earliest example, however, dates from circa1960 - a remarkable design featuring tow rope, paddling pad, distinct rocker, high aspect fin and swallow tail. 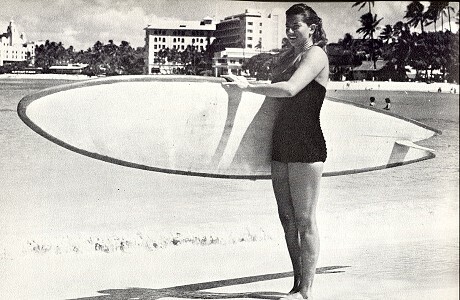 One of five photographs of Jean Seagrave-Smith and her Swallow tail board, pages 3 and 4. Very early model by this manufacturer, probably at Old Berry Bakery address.